I was never a fan of stuffing poultry for two reasons. First, as far as my experiments went, the meat somehow comes out better if no stuffing was inside, while it was roasting. Second, with me stuffing always gets time consuming and messy. However I very much like the idea of having a side dish, which is deeply echoing the roast poultry. E.g. in case with duck, it can definitely be something cooked in duck fat and with same spices. I just cook this side dish separately and not inside the bird. This time it was quince, because I really love quince. This weird fruit, which is completely inedible, when it's raw, gets incredible flavor and texture as soon as you give it some simple cooking. This transformation always feels like magic. It is a bit similar to apple, but has own lovely flavor. 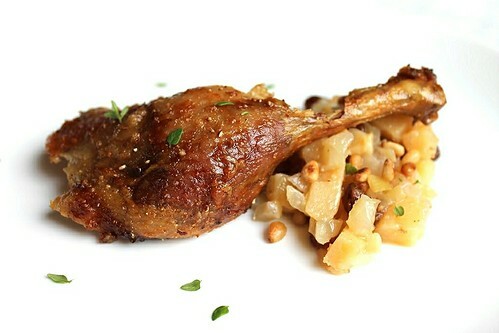 Sour apples could be another great option to complement the duck by the way. One more beautiful thing about the duck is it's back. When you cut the ready bird into portions you normally separate the legs, than wings. Then you slice the breast and you are kind of done. Other parts (like back, neck etc.) aren't normally deemed to be servable. I can't tell you how happy it makes me, because I need no excuse to keep them for myself. Hard to explain, but I find they always taste the best. Especially if you can have them by yourself with nobody watching (needless to say that no knife or fork are involved here). As it was me cooking, nothing difficult is involved in the process. You season your bird and stick it into the oven. While its roasting you chill around and prepare the garnish on the stove. If needed both can be done in advance and reheated beautifully for your holiday lunch or dinner. If you are using frozen duck, you will need to fully unfreeze it. The best option is to let it unfreeze in your fridge, but this will take no less than 24 hours. So if you are short of time, let it unfreeze at room temperature. In any case, it is better to take it out of the fridge 2 hours before roasting, so it is not very cold. Take the pluck (it is better cooked separately, so I normally freeze it and come back to it some time later). Rinse the bird in cold water and dry with a paper towel. Remove excess fat from the bottom of its belly and keep it for preparing the quince (recipe below). Remove the wishbone if you like (this will make carving the ready bird easier later). Stab the breast here and there with a toothpick to let the fat come out easier during the roasting (you need to pierce just the skin, no need to go deep into the meat). In a small bowl combine orange zest, ginger, white pepper, salt and oil and mix together. Rub the bird with the spicy mix. Make sure to cover it both outside and inside. Tuck the wings under the bird's back and place it back side down into a deep roasting dish. 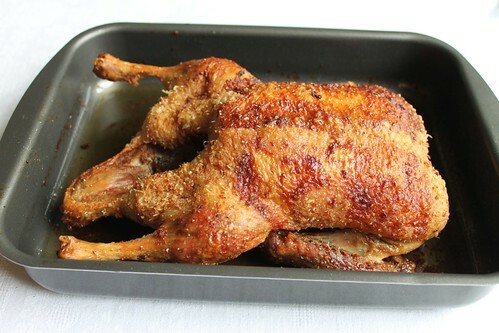 Roast at 180C for around 2 hours (if your duck is larger or smaller, you will need to adjust the roasting time - it will be around 30 minutes per 450 g of duck's weight). After the first hour, take it out, brush with some of the fat, which melted out and return to the oven. Repeat this each 15 - 20 minutes during the remaining roasting time. Take the duck out of the oven. Check the readiness by stabbing the fattest part of the leg. The juice, which will ooze out, should be clear. Cover the duck with foil and let stand at least 15 minutes before carving. 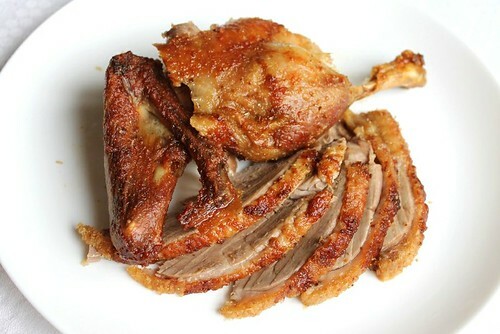 Before serving, cut the duck into portions. Separate the legs, than wings. Then slice the breast 1 cm thick. Serve hot, garnished by quince (recipe below). On a holiday dinner, I would also definitely have some mulled wine before and some lemon caraway biscuits after. Place the duck fat in a medium pan and set it over low heat. Let it melt (this will take around 10 minutes). Remove the cracklings. Increase the heat to medium. Add onion and fennel. Cook stirring from time to time for some 10 minutes, till they are very soft. Add the quince, orange juice, sultanas, sugar or honey, salt and white pepper. Bring to a boil and cook on low heat under lid for 15 minutes till the quince is soft. Take off the heat and taste. Adjust salt, sugar and pepper. Mix in the nuts. Serve warm to complement the roast duck. Wow! What a beautiful dish. I have never had duck, let alone MADE duck. It looks so extravagant. And the quince looks awesome too. Nice work!